Thank you for being a valued Studioware user! Studioware continues to grow every month with many new Basic and Premium Edition subscribers. We are continuing to add enhancements to the software, and updating our articles on the Studioware Help Center. There have been many excellent enhancement requests on studioware.uservoice.com. In this month's newsletter, we will present some ideas on how Studioware can save you money and help grow your business. You can try Studioware Premium Edition for Free! Studioware has a 100% Satisfaction Guarantee Policy. If at any time you feel that Studioware is not providing the value you expect, we will happily refund the balance of your last payment and switch you back to the free Basic Edition. You are under no obligation and can cancel your subscription to Studioware Premium Edition at any time by clicking on the Cancel link in your account settings. As a courtesy to our Premium Edition subscribers, we will import your student data into Studioware for Free! For example, you could create a monthly newsletter detailing events that are occurring at <<Business Name>> . You could use custom letters to help expand your business by sending a $20 coupon, for example, to all inactive students in an attempt to get the students to return. Studioware contains a full Accounts Receivable module. Every student and family receives a financial account where financial transactions such as "tuition", "payment", "scholarship", "refunds", "purchases", "adjustments" and many more can be entered. For example, if you need to deduct tuition from a student's account because the student has a $20 coupon, you could enter in a "tuition refund" transaction into the student's account. Fees for Credit Card charges can be expensive. Typically, a 3% fee is deducted from each credit card transactions. With Studioware you can create and print professional-looking invoices. The invoices can be configured to include your Business name, logo, mailing address, notes, terms, and an invoice stub (the invoices are also configured so that a student/family mailing address will be displayed through a "window" in an envelope if you wish to mail your invoices). With a paper invoice, students/families/parents are more likely to pay with a check; This saves you the credit card transaction fees. Of course, online payment of invoices is also available. 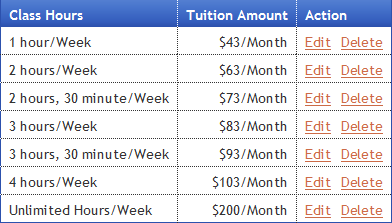 Studioware now allows you to create "hourly" classes and Tuition Fee Schedules. Studioware can now calculate the number of hours of classes a student is enrolled in, and post the tuition fees to the student's account. 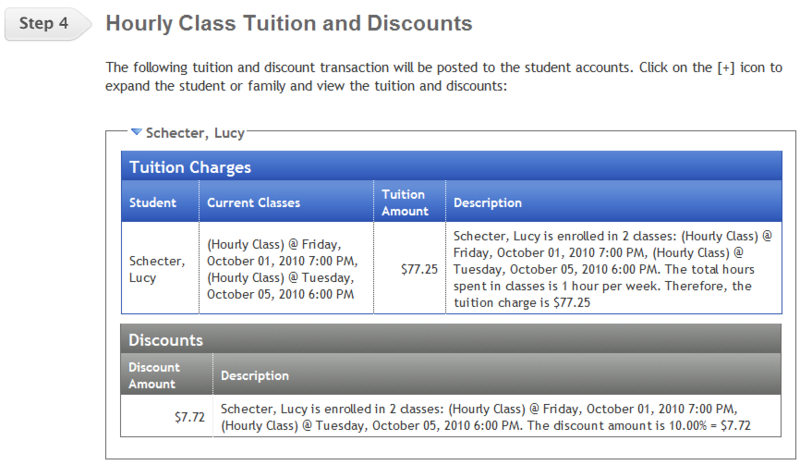 Studioware also automatically calculates and applies any discounts to the student's accounts. If you have any questions or comments, please contact our sales department at sales@Studioware-Online.com. Welcome to the September edition of the Studioware Newsflash. We’ve been busy adding the enhancements you requested at studioware.uservoice.com and we are happy to state, that we’ve implemented a number of significant enhancements! Remember, you can always submit a suggestion, enhancement, or vote on your favorite enhancements. We encourage you to logon to Studioware at www.Studioware-Online.com/Logon to explore the new features. Studioware is the easiest and most economical way to manage all aspects of your studio! The Basic Edition of Studioware is always free and the Premium Edition is only $20 (USD) per month. Did you know that if you are not completely happy with the Premium Edition of Studioware, you can cancel your Premium Edition account at anytime and we will refund you the balance of your last payment. There is no obligation when you sign up with the Premium Edition of Studioware, it’s 100% Satisfaction Guaranteed, and you can cancel your Premium Account anytime simply by clicking on a button on your account page. You asked for the ability to delete students; you can now delete any student in your Studio. You can also add additional “Student Statuses” to help categorize your student lists. The “flow” of the Online Class Enrollment pages have been enhanced. For more information on Online Class Enrollment please review this help article. You can try the Online Class Enrollment at our fictitious/test studio: ABC Dance Studio. Allow your students and families to enroll in your classes online. Online enrollment is simple to setup and it saves you hours of administrative work. Track all of your students, staff, classes, enrollment, and waiting lists. Studioware’s easy to use interface makes it simple to use. Generate invoices! The invoices can be printed and mailed, or the invoices can be emailed to payees. Studioware allows the payees to pay the invoices online and also tracks the status of the invoices; You can easily see which invoices have been emailed, which invoices have been viewed by the payees, and invoices that have (or have not) been paid-in-full. 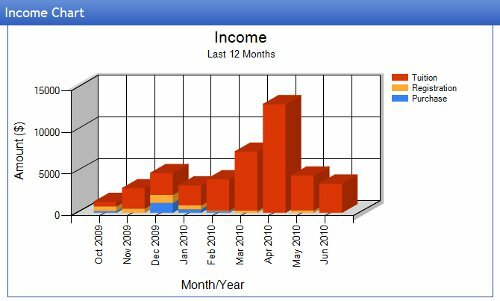 Studioware contains many financial reports that track your business’s profitability. Studioware contains hundreds of features and is available for only $20 (USD) a Month! Studioware now tracks all of your communication with your students, staff, student contacts, and student payees with our new Custom Letters enhancement. Custom Letters allow you to merge your Student or Staff data into a letter that can be emailed. The Custom Letters can be emailed to individual students or staff, all the students from a class, all the students in your students, students with outstanding invoices…..you can even accumulate a list of students for a custom letter simply by searching for the student by their last name. Why do you need Custom Letters? It’s the 16th of the month and you have overdue invoices that have not been paid-in-full. You can use a custom letter to email the payees of the outstanding invoices to remind them a payment is due! The custom letter can contain custom letter fields that can be merged with the student’s name and address, the list of the classes the student is enrolled in, the tuition charges on the student’s account, and a friendly reminder that the balance is due and is subject to a late fee if not paid. The students/families of a class need to be reminded to order their costumes for the recital. You can easily create a custom letter and email it to the students in a class….All with just the click of a button in Studioware. You need to close the studio and cancel all classes because of bad weather in the winter. You could email a custom letter to every student in the studio detailing the reason for the closed studio and any additional information you need to communicate. Are You in Control of Your Studio? Are you still running your studio on pieces of paper that are scattered across your desk? Maybe you’ve organized your student and class lists in a spreadsheet, but you’re struggling to keep the information up to date (and you really could benefit from financial reports to help you run your business and guide your future decisions). You Teach, Studioware does the rest! Studioware tracks your students, staff, classes, invoices, payments, enrollment, waiting lists, schedules, financial transactions, and more. Studioware saves you time by letting your students enroll and pay invoices online. This frees up your time to expand and grow your business. And Studioware is only $20 (USD) a Month! We’ve enhanced the www.Studioware-Online.com website. Check out the improved home page, the features and tour pages, and the testimonials at the bottom of every page. Payments Detail Report: This report details all the payments received by your business for a specified time period. Payments Daily Summary Report: This report summarizes the payment transactions for a specified time period. 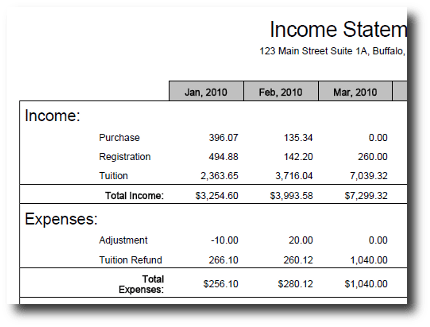 Together with the Income Statement Report, the Accounts Receivable Analysis Report, and the Class Revenue Report, you have a financial “snapshot” of your business. When adding a financial transaction to a student’s account, you can now set the transaction date to any valid date (including dates in the past or future). You are currently browsing the Studioware-Online.com Blog blog archives for October, 2010.